an electricity export industry unparalleled in B.C.’s 30-year history of power sales to the U.S.
We want British Columbia to become a leading North American supplier of clean, reliable, low-carbon electricity. Immediately, the Liberal chorus began. How fortunate that British Columbia had a government determined to spend big dollars to increase exports to American markets for electricity. Lucky too that Liberals had the full support of business leaders and a courageous corporate press willing to stand with the government and call out naysayers who thought it was a mistake to commit tens of billions more to insure private power producers against business risks. 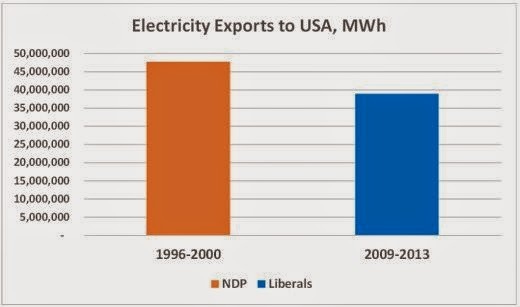 However, some of those same timid obstructionists might now be asking how BC Liberals’ “unparalleled” plans for power sales to the USA are working out. Since Tom Fletcher and his colleagues in the Legislative Press Gallery might be too busy to mention the subject, I reviewed electricity export figures collected by Statistics Canada. Here’s a comparison of the last five years (2009-2013) under BC Liberals to the final five years (1996-2000) of government by those anti-business, anti-commerce New Democrats. Any idea what happened? Was America's fracking madness a factor in this? Again Norm, I thank you for taking the time to research & inform. It's too bad the MSM can't afford the time to have you show it's so-called reporters how to do this & write stories that are not just simply checking the spelling on Liberal media releases. Like all BC Liberal BS, what was promised was that of pixie dust and fairytales. Yet not a peep from the mainstream media, which makes one conclude that they are an arm of the BC Liberal propaganda machine, repeating the various lies by Gordo and photo-op that they are perceived as truth by the great unwashed. The same govt now wants to export LNG. How's that working out? And how much was the Tsawassen transmission line. ?Is it used now.? Is the Tsawwassen experience about to be replayed north of the Fraser River? Norm, the Evil Eye lives in Tsawwassen. From what I can deduce with the rumours, etc., during the power line fiasco, Campbell wanted to use the direct route through Tsawwassen as part of a grand scheme to ship power to Washington state, via the present power infrastructure to the island and a second underwater line from Victoria to Port Angeles. This where the extra “run-of-river” power was going to be sold down South. 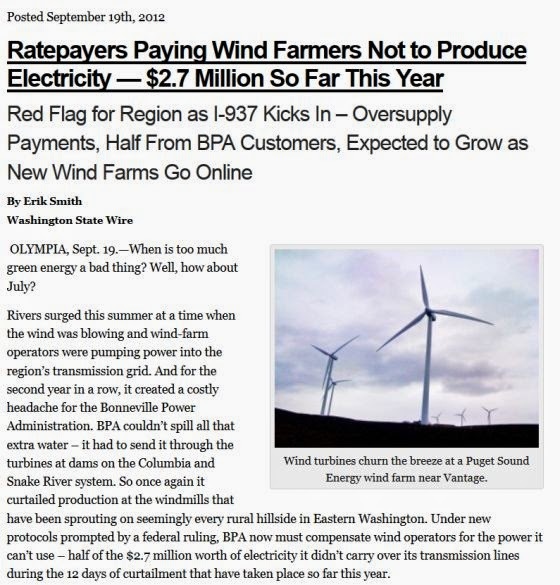 As things turned out, cheaper 'green' power in Washington and Oregon has killed the demand for R-o-R..
All this power line angst, a seat lost to independent, Viki Huntington in two elections, over the collapse of power sales to the USA. Photo-op, of course, never completing her studies at SFU (or anywhere else for that matter) remains ignorant of recent history and now is trying to bribe voters in South Delta with a $3 billion “bridge of dreams”, so that Panama Max oil tankers and colliers can steam up the Fraser to Fraser wharves to load Montana coal and Kinder Morgan oil, unless, of course, those deals collapse as well and taxpayers will be stuck with a $3 billion bridge to gridlock, starting at Blundell in Richmond. I agree with Guy in Victoria. I really appreciate the statistics that are presented here and cannot believe the media are so obtuse! good article and thank you for your work. its so nice to have this information! Now that it has been demonstrated once again what great business people these liberals are perhaps we can look forward to all the money the province won't be making from LNG as one of your previous articles mentioned. When I told friends about that one, not one person knew there had been such a great reduction in income. Oh, well when we truly become Detroit North and the province declares bankruptcy maybe then people in this province will understand what a bunch of idiot the liberals truly were and are. We have had the grinning hyena talking families first, jobs, jobs, jobs, we need to grow the economy but all we do is get poorer. Like what are those liberals taking. At least the Washington State politicians can honestly say they are growing their economy, they legalized WEED and are making money. Perhaps the grinning idiot in victoria could just take her line of growing the economy and start letting us grow WEED legally, well I know its a federal things, but really lets not let facts stand in the way, Christy never has.